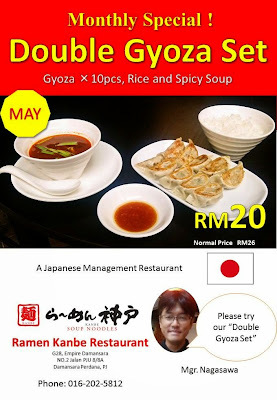 The Ruthless Eater: Review: May Promo - Double Gyoza Set! Review: May Promo - Double Gyoza Set! Since 7 of us were there to review the May promo item, we took the opportunity to review the rest of their items in the menu as well :) Enjoy this gastronomical journey as you read through each item I'm reviewing...oh ya, I've done a review previously on this restaurant, so you can find my review on their other dishes here. I've had this the last time & I still liked it. Really "kao" & I love the intense punch of lemon infused into the tea. Could have few glasses at 1 lunch/dinner serving! I've never had cold ramen. More often than not, I've only seen cold soba served at Japanese restaurants. Call me 'ulu', but I actually liked this. It's a light, fun, & satisfying dish that is far from boring. In fact, this was one of our most satisfying dishes this evening! It has a 'tang' from the vinegar, is fragrantly savory from the light soy sauce & has an added 'zing' from the karashi paste, something that tastes like a cross-breed of mustard & wasabi. Fuh! "Ada kick!" This is their signature item (this Jap restaurant is really pleased with its VERY simple dishes, I must say). It's steamed rice covered with juicy fried egg...yeah, JUICY fried egg, mind you, & topped with their special home made soy taste sauce. I found this REALLY simple, but delicious nonetheless...fried egg, aromatic gravy & pearly steamed rice...mmm...simple pleasures of life! Pieces of shoulderloin of pork served with boiled bean sprouts (beneath the pork slices) & spring onions. It's not those fatty charsiu nor anything like our glazed barbecue Chinese-style charsiu. Very simple & nothing to complain. Best part, it's not dry although it doesn't appear to have 'sufficient' fats on each slice. Frankly speaking, this is also my 1st time having a bowl of wantan soup at a Japanese restaurant. Heehee. It's a simple fuss-free meat dumpling, similar to the Chinese style, but the soup base is their signature soup base, used in all their ramen dishes. Nothing very unique to shout about, but nothing to complain as well. There you go...pretty much the main items & variety that they offer here at Ramen Kanbe. Simple, comforting, fuss-free & I must say that their manager, Mr Nagasawa is very humble & open to feedbacks, new ideas, & suggestions for improvement. Business hours: Daily 11:30a.m. - 10:00p.m.